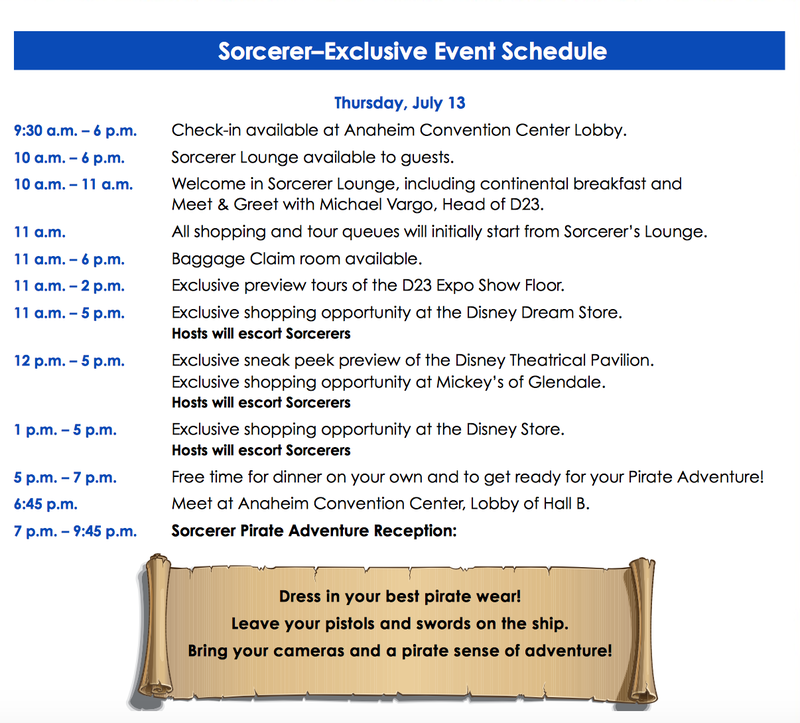 What is it like to be a D23 Expo Sorcerer? I’m finding out right now. This week, the emails started to come in explaining what might be happening at the Expo this year. I say “might be” because Disney likes to offer surprises. It’s part of their strategy to make you feel like the money you spent was worth it – and generally they do a very good job with that. But I actually had a hard time finding good reviews about what it’s like to take this journey so I thought I would actually do a series of blog posts recording my experience for any future potential Sorcerers. I’ve been to three previous Expos but this is my first time so it’s all new to me. My custom Sorcerer Name Tag? I’m already excited. In years past these looked like Cast Member name tags with special art work and/or lettering so I’m curious what it will look like this year. A few days later we get an email with instructions for the Random Selection Process (or RSP) for unique and limited edition stuff from the Disney Dream Store and the Disney Store! Unfortunately no RSP for Mickey’s of Glendale but I’ve never been disappointed with their stuff so no worries. They have some AMAZING stuff for sale (weird that I’m spending tons of money – to get the chance to spend more money). But since I covered that in my posts about the Dream Store and LE merchandise I won’t go into it here. Just click on the links and find out! About 2 weeks later I get the results back from my RSP (I know, it sounds like I’m waiting for ultrasound results). I got everything I wanted! Now I only asked for three things and they weren’t highly limited, but they were the three I wanted the most. I’m still not used to spending hundreds of dollars on unique stuff. Upon reflection, I should have ordered all the unique stuff and put it on eBay. I would have already paid for my Sorcerer’s Package. But live and learn. The cool thing about shopping at the Dream Store is my annual pass discount works there! I also appreciate they didn’t take my money until just last week so it’s not like they were sitting there making interest off my money. I thought that was cool. And I got all the Buy It Now! merchandise I was hoping for including a complete set of limited edition pins! Yay. Then, just last week we get an email detailing our special preview day. What I thought was going to be a three hour event turns out to be an entire day of activity! Yowza. Had to get another hotel room that night just to be there on time and not miss anything. Thankfully, we’re driving or would probably have needed to change flights. I’m not too worried about someone reading this post trying to crash the party. It’s not like it isn’t well known this is happening, plus there are some mighty tough security guards to get past. I have a feeling that even though the day starts at 9;30 pretty much all of that will be waiting in line to get into one of the three stores. I think I’m going to sacrifice the Dream Store for Mickey’s of Glendale. There’s too much cool stuff in MOG that I want. And the Disney Store line will probably be massive. Even with just Sorcerers. Hard choices to make, but even as a Sorcerer you don’t get to do everything. I’ll still go to all three, but some of the hard to get LE stuff will likely be gone. What they folks running the event haven’t been able to tell me for sure is whether or not Sorcerers will get early access to the Show Floor or priority line status like they did last year. I hope so because that’s one of the reasons I shelled out the money. But we will see…. Massage therapists? Get out of here! I am SO taking advantage of that. Now how to fit that into my schedule…. Love that they have a baggage check for Sorcerers. Makes it so much easier to walk around – and a food location just for Sorcerers is handy since some of the places on the floor can be pretty busy (and honestly not that great – last time they had food trucks and those were great). So now I’m waiting for another email as I write this. In that email last week it said we would get a follow up “in a few days” with an opportunity to sign up for the panels we want to see. I guess that’s so they can reserve our spaces and make sure they handle the flow of everything correctly. However a “few days” have now turned into a week, and I’m getting anxious. Not that I think they won’t come through, but we were told a “few days.” For Disney that usually means no more than 3 (as they always want to exceed guest expectations), but I’m still waiting. I’ll let you know how that turns out! Oh, and here’s a map of the floor we just received, too. A map of the show floor including vendors, locations, etc. 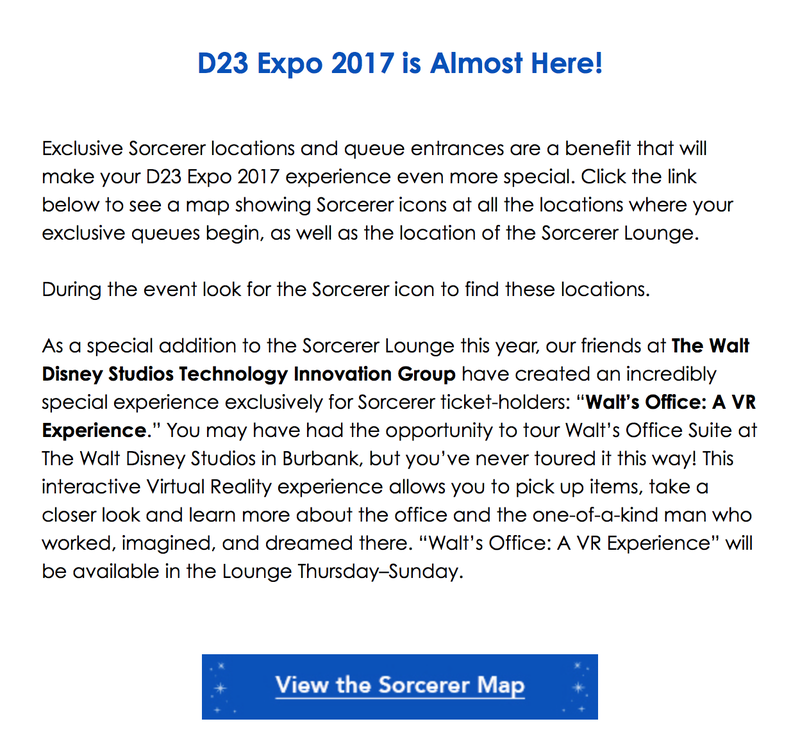 A Walt Disney VR Office Experience? Sounds awesome! Well, still waiting on that scheduling email, but more and more surprises keep coming my way. I hope you’ll enjoy this journey with me. For more info about the Expo, be sure to visit our Expo dedicated page and check out all the links to articles about what to expect. I’ll keep it updated as new info becomes available. In part 3 I tell you all about Sorcerer’s preview day! Love all this info. When can we expect the next entry? It’s already up, Sean! Hope you enjoy it! When purchasing the tickets (for the sorcerer package) do they take the total amount all at once? or do they take a portion and the rest later? If they did it like last time, they take it all at once.